Update: Paul Swenson's body has been found. Foul play is not suspected. Our deepest condolences to the Swenson family and those who knew Paul. Before the rise of social media, only celebrities lived public lives, lives we watched through interviews, articles, tabloids, and paparazzi footage. However, with the recent rise of social media, anyone, anywhere, can make the decision to live this type of life: to share photos constantly, share personal blog posts about anything from a new baby to a death in the family, and to allow the world to comment on the most intimate possible moments. We all have access to do this, and I’m sure at one point or another you have shared something person with your “followers.” There could be ten or there could be ten million, but you have allowed certain people, and oftentimes strangers, to witness your life as it unfolds. And comment on it, for better or worse. This is exactly what is happening in the story of a missing Utah man named Paul Swenson. Paul’s wife is a style and design blogger, as well as a “mommy blogger,” someone who writes posts and takes photos that showcase motherhood. Known online as Ashlee Ann, she announced her husband’s disappearance via her Instagram on July 27th. The post was in the style of a missing poster that described Paul and detailed the day before, the day he went missing. The story goes like this: Paul left his home in American Fork around 3:00pm to go to an appointment in Salt Lake City. Prior to leaving, those close to Paul state that he was saying things that did not make sense, but they did not elaborate further. The next day, authorities found his black 2016 BMW “under suspicious circumstances,” parked next to an elementary school in the Glendale neighborhood of Salt Lake City. Police believe that several of the items found inside the car do not belong to Paul. Prior to the first post made about Paul’s disappearance, Ashlee’s Instagram is full of happy photos. Photos of the couple’s new baby being held by Paul while he smiles widely wearing a backwards cap. Photos of blonde Ashlee smiling in various well-thought-out outfits, standing in pretty locations. They seem to be some sort of otherworldly family, very attractive, glowing with a quality that resembles exuberance. They are young: Paul, 30, sporting a sleeve of tattoos. Both Paul and Ashlee falling into the hipster category. They seem like a perfect example of a new, cooler kind of American family. And yet, a manufactured perfection lingers, one that many of us are guilty of seeking. Just look at Ashlee’s 50K followers. And so, as soon as the announcement came from Ashlee, the media jumped on the story. We are interested in breaks in perfection, we are interested in beautiful people, we are interested in darkness and mystery and pain. American media and its consumers are infinitely more interested (unfortunately) in the disappearance of affluent white people who look like the celebrities we have long been obsessed with. And Paul’s sudden disappearance has been a huge one, prompting all kinds of responses from fans and critics alike. And as you can guess, conspiracy theories abound. To visit the Facebook page Bring Paul Home is to watch the internet do what the internet does best: get into petty arguments with strangers. Rumors, gossip, and accusations take up the most space, punctuated by posts about praying for the family, and reproaches toward those that question the motives of the family and Paul himself. Welcome to the traditional cesspool of internet comment sections. You don’t leave feeling good about humanity. You leave feeling the deep rift of humanity itself. Perhaps the most common theory that commenters are addressing is based in a blog post titled “Monsters are Real” that Ashlee herself wrote in June of this year, less than two months before Paul disappeared. The post details the way that Ashlee dealt with Paul’s infidelity. I know my name has been in your mouth and I know what you must be thinking, I’ve thought the same things before. Why would she stay? She must not know. But guess what? You don’t know what we have been through and you know what else? You think you know what you would do in a situation until those cards have been dealt to you. This post has been used as evidence that Paul most likely left on his own accord, either to reconnect with the woman he had an affair with, or to escape the pressures of a public marriage and life. There have been rumors of past drug use, rampant ones in fact, with commenters saying they know the family, know friends of the family, etc, but present no hard evidence. There is also no evidence of any mental health issues. The fact that Paul was saying things that didn’t make sense to his family, as well as the strange state of his vehicle, however, seem to point toward one of those two scenarios more so than it points toward a willing abandonment of his wife and daughter. Then there is the gofundme created by a friend of Paul’s. People are using this to demonstrate that his disappearance was a hoax intended to make money via donations, which at this point is exceeding $15,000. However, gofundme offers refunds at anytime, as Paul’s friend has made clear. His friend also clearly stated that he created the page on his own accord when he heard the news. It was not created by Ashlee or Paul’s parents. They haven't asked for anything but help spreading the word. More likely Paul left on his own accord, unbeknownst to Ashlee and the rest of his family. More likely, Paul experienced some sort of mental health crisis, which can come on suddenly at any time. Any of these scenarios are painful, and the latter could be deadly for Paul. Paul and Ashlee have a very young daughter; it’s vitally important to remember this. I am angered at the comments, demanding answers, saying the public deserves them. Of course we want answers, but this is not a TV show, this is not a game, this is a family that is hurting in a way most of us cannot imagine, and I’m guessing that those who know how it feels are not the ones typing venomous comments based in tacky conspiracy theories on a page dedicated to helping locate a missing father. So many people are claiming their right to to ask aggressive, cruel questions because Ashlee is a public figure, therefore she has brought it on herself. This is true in a sense; she did make a decision to live publicly. But why does that give anyone the right to cause her harm? It's a bizarre logic that says more about the person writing it than Ashlee herself. Anything is possible, I know. But isn’t it wise to air on the side of logic here? To give a mother and a family the benefit of the doubt? To not make things worse? Discuss your conspiracy theories all you want, but don't clog a missing person's page. No one is forcing anyone to donate, to look for Paul, to even pay attention. So, just leave the page instead of spreading more pain. It’s easy. Just stop. We typically only share the happy moments of our lives on social media, it’s our highlight reel. But it’s not our real, reel and that’s ok. We don’t need to share every last detail, but we have to remember that everyone is going through something whether we know about it or not, and my hope through all of this is that we can be a little kinder with our words, a little more forgiving and a lot less judgemental [sic]. We are all in this life together, and it can be a lot easier if we are on the same side. On Tuesday it was announced that the search was expanding outside of the Salt Lake City area and becoming a national one. 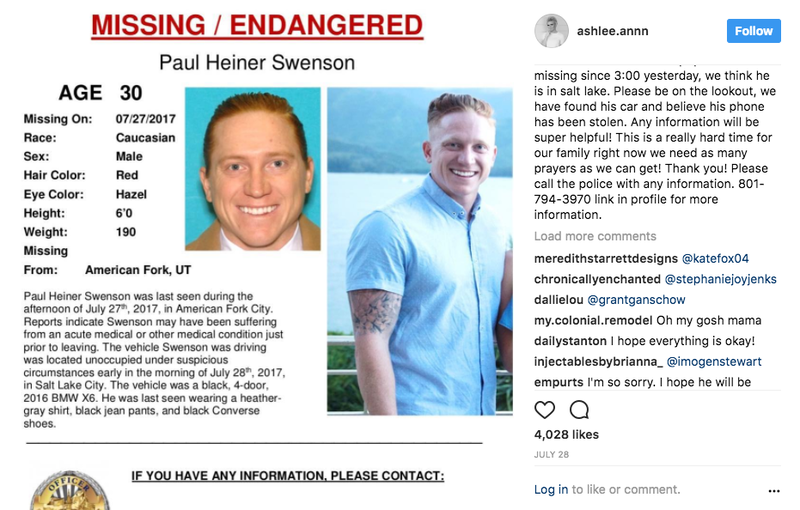 If you have information on Paul or his whereabouts, please call the American Fork Police Department via Utah Valley Dispatch at (801) 794-3970.